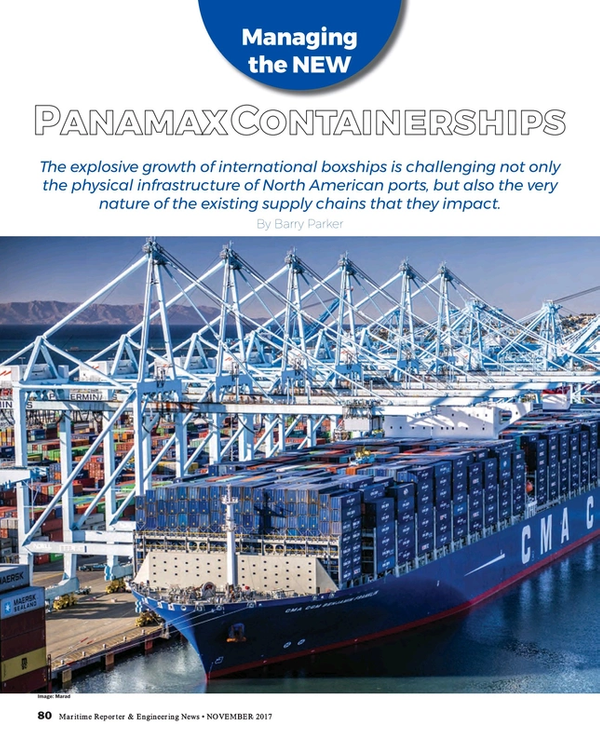 The explosive growth of international boxships is challenging not only the physical infrastructure of North American ports, but also the very nature of the existing supply chains that they impact. The recent dialogue on container shipping has been all about so-called “mega-ships;” those vessels that with larger capacity than those that are already in service at any point in time. In the container trades, as in tanker and drybulk arenas, ocean-going vessels are one link, albeit an important component, within broader supply chains. Unlike most other transport supply chains where the cargo side determines the overall architecture of the chain, the liner companies carrying containers appear to have dictated the critical linkages that make up supply programs. This fundamental dissimilarity has profound implications: the landside infrastructure for handling containerized cargo, rather than leading the charge, will always be playing catch-up. Mega-ships are (depending on your viewpoint) symptomatic of the problem, or – alternatively – part of the logistics solution. The Panama Canal also got the message, embarking in 2006 on a $5.5 billion project that would allow vessels of up to 14,000 TEU to transit (contrasted with the previous size constraint of roughly 5,500 TEU). Though only 500 boxes were discharged by the Regina Maersk at New York, port planners there began looking in earnest at deep dredging (in a project that began in 2004), and at raising the air-draft of the 1930’s vintage Bayonne Bridge to 215 feet, in a $2 billion project that commenced in 2013 and is now complete. Down the East Coast and into the U.S. Gulf, ports have already finished, or are now in the midst of channel deepening projects – typically to 50 feet depths that will allow transits of ships as big as 18,000 TEU. Upon completion in 2016, the “neo-Panamax” vessels began transiting through Panama – bringing Asian cargo to the East Coast. CMA CGM, owners of the Franklin and Roosevelt, is now set to begin a regular routing of vessels up to 14,000 TEU from Asia to the East Coast. “We’re thrilled to have CMA CGM T. Roosevelt call at our port and serve as the celebratory vessel for the raising of the Bayonne Bridge,” Molly Campbell, Port Director at the Port of New York and New Jersey, explained in a prepared statement. “We invested billions of dollars to raise the Bayonne Bridge, deepen harbor channels, install rail facilities at all of our terminals and improve our port road network, with the goal of attracting the world’s biggest ships and cargo to our port and the jobs and economic activity they provide,” she added. But, harbor development is not restricted to the East Coast. In Southern California, the 10 year channel deepening at the Port of Los Angeles (completed in 2013) saw creation of a passage of 53 feet in depth. A $1.5 billion bridge replacement for the Desmond Bridge in Long Beach is also underway. When completed in 2018, the larger vessels will be able to enter terminals near downtown. The larger vessels pose challenges for ports, and the landside infrastructures that link them to hinterlands. With economic growth, TEU throughput will continue to grow. At the AAPA confab, Mario Cordero, the former Chairman at the Federal Maritime Commission (FMC), who recently became Executive Director at the Port of Long Beach, provided some guideposts on anticipated growth. Referring to the San Pedro Bay port complex (Long Beach and Los Angeles), Cordero pegged 2015 throughput at 15.4 million boxes, and then offered forecasts of 28.3 million and 41 million boxes for 2030 and 2040 respectively. He continued, “Moving forward, we need to focus on efficiencies in the supply chain,” explaining that Los Angeles and Long Beach are working cooperatively on a supply chain optimization project (after gaining FMC approval to do so, in 2015). Existing infrastructure is stretched. Commenting on the impact of liner alliances, Cordero said: “Going forward, we may have fewer port calls, but each port call may involve more significantly more container movements within the port terminals.” These comments jibe with results of a recent survey by Navis (part of Cargotec Corporation), a leading provider of Terminal Operating System (TOS) software, where 76 percent of respondents listed “optimizing operations to improve productivity” as their biggest challenge. Where land is scarce and that’s certainly the case in urban U.S. ports on all three coasts, it’s important to move boxes out of the port area as quickly as is possible. And, dwell time for boxes has become even a bigger issue when a mega-ship can discharge thousands in a single port call. Indeed, Mark Sisson says, “The hinterland connection is where a lot of the competition is going on.” Separately, Cordero highlighted steps taken to prepare for the new dynamics, notably a $4 billion program to get ready for mega-ships. Inland connectivity, taking the form of increasing rail infrastructure, with the additional benefit of getting trucks out of the port district, was stressed. In Long Beach, he says that the Port Commissioners have established a goal of 50 percent of boxes moving out through on-dock rail (compared to the present 28 percent). Such a strategy is intertwined with another emerging strategy; that of inland port/ shuttle trains. Another part of efficiencies at all ports is quick container pickup, with Cordero, speaking at the AAPA event, emphasizing Long Beach’s goal of having “uniform appointment systems” at terminals throughout the port. Efficient uses of chassis are a big part of that equation. In Long Beach, which has had a ‘pool of pools’ since 2015, port officials are now looking towards a ‘gray pool,’ one managed by a neutral entity, to keep cargo moving. Improved data capability (with increased transparency) is a key component of any supply chain optimization, and Cordero discussed ongoing efforts underway. He hinted at upcoming news regarding cooperation with Los Angeles, in a container data portal project spearheaded by GE Transportation Systems. Mega-ships are still a work in progress. The revolution in efficient transportation that began in the late 1950’s is powering onwards. But just because the yards can build vessels of 21,000 TEU capacity (and larger) such as the recently delivered OOCL Hong Kong, the ocean going vessel link must be fitted into a twisting supply chain of enormous complexity. This process is not without numerous fits and starts, as port planners in the States, and elsewhere, have experienced.